Sgt. 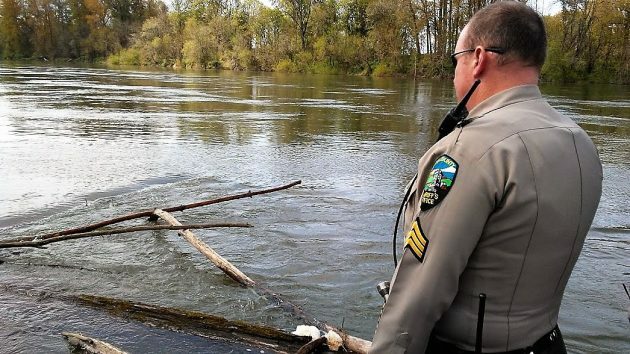 Ryan Moody of the Benton County Sheriff’s Office looks at part of a snag before it was removed last week at the end of the Bowman Park dock. In other riverfront news, Albany-area boaters are still waiting for the new floating dock at Takena Landing, but the ramp at Bowman Park is once again clear of woody debris and OK for putting boats in and taking them out. A big snag had been blocking easy access to the Bowman dock from the river, and it made launching a bit tricky too. A tree and a bunch of roots or branches had been lodged under the float for some time. They were still there last Thursday when a Benton County sheriff’s deputy became aware of them. By Friday they were gone and the dock was clear. Upstream at Takena, the new metal dock the city of Albany bought with a grant from the Oregon State Marine Board has been sitting in the parking lot for a few weeks. When I asked the parks department last week, I was told they were waiting for better weather and the river level to go down. The weather has been great the last few days, and the Willamette is down to a fairly moderate flow. So maybe they’ll install it in the next few days. I went by Takena Landing on my way to an Albany City Council meeting, which was about as exciting as life on the riverfront has been lately. One thing of note: As expected, the council unanimously approved an agreement to have the Albany Fire Department provide fire and life-safety services to all of Millersburg. Millersburg will provide a station, probably a temporary one at first, and Albany will staff it. The smaller town will pay Albany $2 per thousand dollars of property valuation, the same as the rural fire districts around Albany. Millersburg’s council approved the deal earlier. 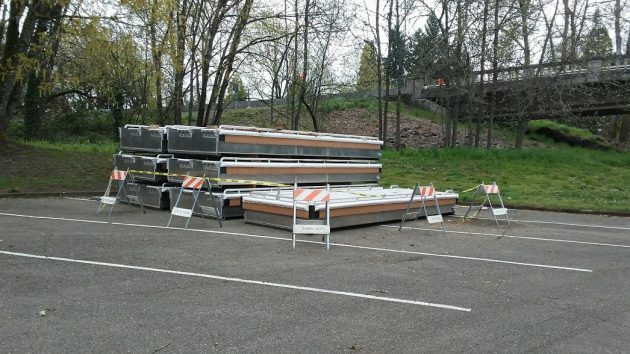 The new Takena Landing dock has been stored in the parking lot, awaiting installation. We in Millersburg value your reporting very much. We thank you for the extra effort this requires using your bike. There are big plans ahead for us for which adequate fire protection and ambulance services are more necessary than ever. What is going to happen to Jefferson Fire District’s existing station in Millersburg? Nothing. The Jefferson fire district will continue to use it, presumably, because it still covers the area around Millersburg.